1. Preheat the oven to 190°C, gas mark 5. Roll out the pastry on a lightly floured surface to about 0.3cm thick, then use to line a 21-22cm, deep, loose-bottomed tart tin, leaving the excess to overhang. Line the pastry with parchment and baking beans. Place on a baking sheet and blind bake for 15-20 minutes, then remove the beans and paper and bake for a further 5-10 minutes, or until light golden. Set aside to cool a little. 2. Meanwhile, fry the lardons over a low heat for 15 minutes, until golden. Remove with a slotted spoon; set aside. Add the leek to the pan and sauté for 10 minutes, until softened. Bring a small pan of water to the boil, then blanch the asparagus for 2-3 minutes. Drain; set aside. 3. Trim the excess pastry from the pastry case and discard. 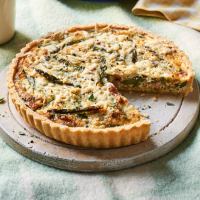 Scatter the leek, lardons, asparagus and thyme evenly over the base. 4. In a jug, beat together the eggs, crème fraîche, cream and 3 tbsp cheddar, then season with black pepper. Pour into the pastry case, scatter with the remaining cheese and bake for 25-35 minutes, until golden and just set. Allow to cool to room temperature. Remove from the tin (or leave it in if transporting) and slice to serve.